Can You Teach Jewish Humor, And If So, Why Not? It wasn’t my idea, I admit. A colleague of mine at UNC-Charlotte overheard me bemoaning the task of teaching our department’s Judaism course. Said colleague occasionally has to teach the general course on Christianity. He sympathized. For one thing, he and I fully agree: There is no such thing as either Christianity or Judaism — not the way we are wont to believe, anyway — until about the fourth century CE. More about that later. For another, no matter how you shake it, either topic is unwieldy, difficult, and a pedagogic pain. Do you teach festivals? Liturgy? Scriptures? Great thinkers? Which history do you emphasize? Whose? “Moshe Waldocks,” I rejoined happily. I was excited. I collected jokes to tell at the beginning of each class. I practiced them at home. I invited my students to tell Jewish jokes. I assigned Mel Brooks and Woody Allen, stories and films, and The Year of Living Biblically. I thought we’d have a blast. It was awful. I’d tell a joke with perfect timing. My students stared at me uncomprehendingly. They did not understand why Mel Brooks made fun of Adolf Hitler. They did not understand jokes about blood libel or pogroms. Actually, most had never heard of a pogrom. I’ve been wondering ever since about my failed attempt at finding an entertaining way to teach Judaism. I’ve mused while bemused. Why were they so lost, so unsure why the material was funny? After all, Annie Hall was a great hit. There just aren’t enough Jews in These United States of America to explain the profits Woody Allen has raked in over the years. In despair, I began wondering how my students would have reacted to a series of “why did the chicken cross the road” jokes. Maybe, I thought, they are so oppressed by our lousy economy and the debt they are racking up in pursuit of an education that there’s nothing they would find funny these days. Segue – though not, actually. A few weeks ago, I was sitting in my surgeon’s office, getting bad news. The lumps on my thyroid we’d been watching for more than a year had apparently demonstrated significant get up and go. One had grown by twenty-five percent. I had tried to avoid the knife, but it seemed pretty clear to my surgeon that my bumpy thyroid was going to have to go. My surgeon is a Really Nice Guy who is, as locals say in Concord, North Carolina, “from around here.” He is tall, fit, and clean-cut. He is thoroughly pleasant, has a lovely and light southern accent, and is a wonderful listener. I thought it was funny. I doubt my surgeon agreed. Like my students, he looked at me with a mixture of shock and confusion. How do I explain this to happy, white, and – let’s face it – mostly Christian Americans? Jews are schlepping around a lot of ugly history in which Jews were oppressed, suppressed, and repressed. These facts of our lives were, in many respects, the least of our worries in the old country. One way to deal with persistent powerlessness is to devalue power. If I pretend the knife is a joke, I can conquer fear. If Mel Brooks can make fun of Hitler, he (and we) can understand how to live after the Shoah which decimated our people. I needed to teach misery first, I decided. Then I could teach Jewish humor. So this semester, my students are learning a lot about European Jewish history. Oppression, suppression, and repression figure in that history. Then they will read The Dance of Genghis Cohn, a novel in which a Jewish man is executed by a Nazi. The Jewish fellow, a third-rate comedian by the name of Cohn, becomes a dybbuk and merrily haunts his executioner. The Nazi learns, in the process, various Yiddish expressions, how to cook kosher meals, and how to observe Jewish holidays. It’s hilarious. This time, around, I hope my students will get it. Here’s why. Maybe if we all got it, future generations of Jews will happily content themselves with lighter forms of humor. And they’ll want to know, too: Why did the chicken cross the road? It’s a question I get as soon as folks realize that my rabbinic identity doesn’t fit in the usual boxes. I am neither a Conservative, Reform, nor a Reconstructionist rabbi. I was ordained almost exactly a year ago, by ALEPH, the Alliance for Jewish Renewal. My congregation is affiliated with Jewish Renewal. Jewish Renewal is not a denomination. We like to say that we are post-denominational. Renewal rabbis, cantors, and rabbinic pastors work in all sorts of settings and in all sorts of shuls, from Conservative to Reform to Reconstructionist to independent (like mine). It’s so very hard to describe something that ranges from starshine to sunshine, something that sparkles and sings and calls on the deepest spaces and places of the soul while making you laugh with recognition. That, I wish I could say, is Jewish Renewal. Instead, I typically offer an academic summary: Jewish Renewal seeks the deep knowledge of Chassidic tradition and strives to reconnect that tradition with contemporary Jewish practice. Jewish Renewal understands halakha, Jewish law, as a constantly evolving creation to help establish the most humane and ethical of life practices. Jewish Renewal will joyfully embrace music, meditation, chant, yoga, and storytelling in the practice of Judaism. Jewish Renewal reads Torah as our deepest challenge and our most precious gift. Or I say: Jewish Renewal is about learning the why and not just the how. It’s about plumbing the very depths of why so that we can hear our private and godly voices of truth. I know, I know. Get concrete. Offer an example. Early in January, I was attending the annual Ohalah conference, which brings together Renewal rabbis, cantors, and rabbinic pastors from diverse parts of the world. When we pray together, there is a joy and an intimacy that belies and transcends the conference hotel rooms. We sit in circles or get up to move and dance. We pray all at once together or in the spontaneous creation of a kind of complicated twenty-part madrigal. It’s awesome, actually. As are the Velveteen Rabbi’s red boots. They are the example you need to understand Jewish Renewal. Here’s how I came to understand that fact. I was attending a Shacharit service. Rabbi Hanna Tiferet Siegel was leading our prayers – softly, gently. Rabbi Hanna Tiferet specializes in making a safe space for those who show up to daven with her. It is never about her; it’s all about our collective, kind intentions. It’s lovely. As we davened, I looked across the room. Chaplain David Daniel Klipper was singing and tapping his foot. If he’d had a drum, he would have been playing. The Velveteen Rabbi, a.k.a. Rachel Barenblat, with whom I was smicha’d (ordained) last year as a rabbi and this year as a mashpi’ah, a spiritual director, is smiling at me. I smile back. I look again. It’s the boots. The red boots. The red boots with laces. Rabbi Rachel’s red boots are a bright, energetic statement. They are beautiful and carefree, much like the mood in the room. They are a strong, rich red. They look solid and soft at the same time. Walking in them, I imagine, must make Rabbi Rachel feel strong and purposeful, ready and wide open for life itself. Later, after davening, I am standing by Rabbi Rachel in the food line for breakfast when a rabbinic student comes up to admire her boots. “They must be a bear to take off, though,” the student says. “They zip!” she says brightly. Over my oatmeal and scrambled eggs, I think about the way in which ideas and traditions and texts are laced together in our conference sessions, our classes, our prayers. Rabbi Laura Duhan Kaplan pulls together Emmanuel Levinas, Franz Rosenzweig, and the spine of a snake. Rabbi Elliot Ginsburg puns on the Hebrew er, for awakening, to “err” so that he can walk us through a look at snoozing and waking on a consciousness level. How do we modulate our awareness, he asks, holding the ordinary and the holy, the flowing and the parched periods of life, the knowledge of presence and absence in one container? I think about the five years of Renewal classes and conferences and the intimate and wide-ranging davening. I think about the way Renewal taught me that Judaism was not represented by large buildings and grand sanctuaries. Judaism is not a complicated form I could never grasp, a list of rules I could never master. I could learn why. I could reach for the depth to be had in each letter of each word. Olam means “world” and “universe” and “eternal.” And it means “hidden” and “secret.” When I address God by saying Ruach ha’Olam, “Breath of the universe,” I take in the knowledge that however one thinks of the divine, there is something magical in the way that breath moves us, sustains us and keeps the whole world alive. Breathing is life is divine is eternal is a mystery. Ideas, texts, tradition – Jewish understanding laced together in a sweet web of life so clearly that I could unpack the teaching as easily as I could unzip a boot. I learned these things in Jewish Renewal, from teachers whose hearts are rich and deep and playful. 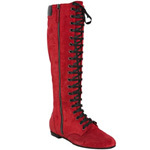 Like Rabbi Rachel’s boots: Red, soft, solid and joyful. This is now my foundation; I walk in Jewish Renewal’s ways.